At Jago we know how important it is to nurture our future PR superstars and over the years we have established strong partnerships with leading NI universities where we offer students a variety of opportunities to gain valuable experience in our industry through internships or work experience placements. I am currently studying Public Relations and Communication Management BSc (Hons) at the University of Ulster, Jordanstown. 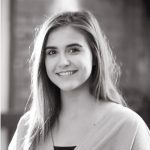 I joined Jago in June 2018 post summer exams as a keen intern, having found out about the work experience opportunity through friends and having attended a guest lecture given by Fiona Hanna as part of our Digital Media Communications course. I was quickly introduced to the working world of PR on my first day when I accompanied a photo shoot for the Powered By Talent event hosted by one of Jago’s clients, Abacus Recruitment. The shoot took place just across the road from the Jago offices, in the grounds of Belfast City Hall and on the most glorious summers day. I was able to meet professionals from a variety of different industries; a surprising one being our newly appointed Lord Mayor, Deirdre Hargey (all in all, not a bad way to be introduced to the company!). Since joining Jago there has been no hanging around. Starting in the busy summer months, and working with such a positive, fast paced and hardworking team has meant that I have been able to really get stuck into proper PR work. This has given me a real hands-on taste of what it is like to work in the world of PR. I have really enjoyed being able to get involved with work that is relevant to young people – for example, researching current social media trends and local events targeted towards young people – which have been incorporated into client campaigns. I have also appreciated being able to help organise upcoming events, contribute to campaign work and gain experience of media relations. In particular, it has been really good to understand how Jago evaluates and measures the impact of all communications for its clients. My internship with the highly organised, hardworking and successful team that is Jago, has given me a complete (and positive) eye opener and prepared me for the working world of PR and what it entails. It has encouraged me and made me more determined to set and achieve goals and objectives as I am approaching post graduate life and it has prepared me for what to expect in the future. I would really encourage anyone studying PR and Communications to take on an internship like this!